Made up of 22 catwalk shows and an exhibition with more than 40 universities participating, the four day event culminated in a gala awards ceremony hosted by designer Henry Holland and television presenter Zara Martin. 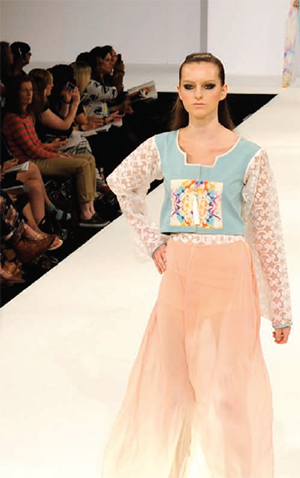 The official production partner for GFW is Fashion Scout International (FSI), having won the contract two years ago. Seeking to step up the shows video production quality, FSI brought onboard Brightonart Ltd, who have for the past two seasons worked with FSI during London Fashion Week. The Brightonart team, overseen by Mark Scarratt, were tasked with providing a clean feed from an HD camera mix, to be supplied to the universities for playback on their stands, and for review by the GFW judging panel prior to the gala show. In all, there were 22 shows during GFW, split across two theatres and running back to back alternate shows. In each of the theatres Brightonart was running a live HD mix, capturing in 1080i50, comprised of two camera sources connected over SDI to a Blackmagic ATEM 1 M/E Production Switcher with Broadcast Panel. In addition, static and animated graphics were played from the ATEMs built in media player enabling end slates and titles to be added in realtime. From that Brightonart had to deliver an immediate clean, usable cut, with start - and end - slates, and production credits. The output formats were tailored to each universities individual requirements, which ranged from having a standard definition DVD-R to a 20 Mb/s H.264 file for immediate web syndication, right up to full 1080i DNxHD archive, according to Mark. Wed take an HD-SDI program output from the ATEM 1 M/E into an ATEM Television Studio, and then ambient audio from crowd microphones is added from a digital AES/EBU feed from the theatres audio mixing desk. That was then encoded and output in H.264 at 1080p25 to a MacBook Pro running Blackmagic Media Express software. Wed then record a backup of the master working file in DNxHD on Blackmagics HyperDeck Studio Pro SSD broadcast deck while the DVD recording was done using the composite output on the ATEM 1 M/E switcher and added an analog audio mix. M/E was replaced with an ATEM Television Studio and a customised broadcast panel. Catwalk projections in both halls were in 1080p50, fed from a Resolume Arena media server over a 100 meter SDI run, with a Blackmagic Battery Converter HDMI to SDI and SDI to HDMI at either end, to a projector on stage, said Scarratt. Blackmagics UltraStudio 4K was used in both theatres to record shorter segments to order from the clean TX feed. According to Mark, Universities were taking these shorter clips and publishing them across various social media platforms, instead of waiting for a finished edit, while a show was still in progress. During the four day event Brightonart used a team of two front of house staff to run the graphics, cut the shows and and make the various recordings required, delivering the files to a media server in theatre A for distribution and processing according to Scarratt. Cutting these shows is almost second-nature now as our camera team are so solid, and the great thing about the Blackmagic Design setup was being able to run uncompressed video all the way to the H264 encoding. In fashion videography there is a constant trade-off between vibrant colours/ contrast and losing detail in the blacks. There is never a proper rehearsal, so we have to get it right first time around, said Scarratt. If we are too conservative in the camera picture profiles, we get washed-out colours. If we crank the levels too much the blacks flatten out. With an uncompressed workflow we can make the most of our camera settings as we dont need to transcode the files before editing or deal with any quality loss as a result of unwanted compression.